Notes: Have you heard about the Moog Etherwave Plus but already own an Etherwave Standard? If so, no problem. 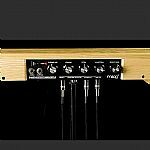 Moog are making this great addition to the Etherwave available for existing Etherwave theremin owners. The result will be your Etherwave with the addition of all the great plus features: pitch preview, headphone volume knob, separate headphone or pitch preview output, on/off switch with LED indicator, 2 control voltage outputs and 1 gate output. The Field Upgrade provides the Etherwave Plus printed circuit board, a new front panel, headphone volume pot, headphone volume knob, headphone jack, on/off switch, LED indicator, and a template for drilling the bottom of your Etherwave Standard. Once received instructions for installing the components and soldering (7 solder joints) the board will be included. Have fun and good luck. The Moog Etherwave Plus has all the great features and tone of the Moog standard Etherwave theremin with some extra flair. The Plus makes it an ideal controller and performance instrument. The Etherwave Plus extends the Theremin's gestural playing technique to the world of analog synthesis and beyond. 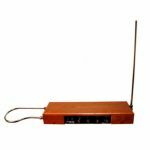 Control synthesizers and effects while playing the Theremin or use as a stand-alone CV (Control Voltage) controller. If you choose the Field Upgrade, simply click on the add to cart button above and the following will be shipped to you around the end of February. The Etherwave Plus printed circuit board, a new front panel, headphone volume pot, headphone volume knob, headphone jack, on/off switch, LED indicator, and a template for drilling the bottom of your Etherwave Standard. Once received instructions for installing the components and soldering (7 solder joints) the board will be included. Have fun and good luck! Note: Please review the Field Upgrade Manual before ordering to make sure you're comfortable performing all of the steps necessary. 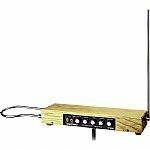 Notes: The Etherwave Plus has all the great features and tone of Moog's standard Etherwave theremin. The Etherwave Plus makes it an ideal controller and performance instrument. The CV outputs control signals are proportional to the pitch and volume of the Theremin's audio signal. Connect to the pitch and volume CV inputs of a Little Phatty, Voyager or other analog synthesizer for a completely new way to play your synth. These CV signals are not limited to pitch and volume control. Route them to any CV destination and create a new world of expression. Control anything from the cutoff frequency of a Moog Ladder Filter or the LFO Amount on a Moogerfooger Ring Modulator to the stereo panning on a Minimoog Voyager. Notes: The theremin is one of the oldest electronic instruments, and the only one known that you play without touching. Moving your hands in the space around its antennas controls pitch and volume. The Etherwave is an authentic adaptation of inventor Lev Termen's original design. 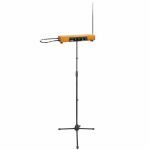 The Etherwave is a quality musical instrument designed for ruggedness and portability. It has a 5-octave pitch range and reliable spacing between notes for sophisticated playability. Antennas are nickel-plated 3/8" brass tube and cabinets are furniture-grade hardwood, finished with a custom Moog stain. The Etherwave is fitted with an adapter for mounting on a standard microphone stand and works best with Moog's TB-15 instrument amplifier. All Etherwaves ship with 2 video tutorials on one DVD: Clara Rockmore: the Greatest Theremin Virtuosa and Mastering the Theremin, featuring Lydia Kavina. The power supply is included: 220V for use in Europe, Asia, South America and Australia. 220V Etherwave ships with DVD in PAL format. Notes: The Theremini is a re-imagination of one of the oldest electronic musical instrument in history, and Bob Moog's first love - the theremin. Its design fuses the experience of performing with an instrument you don't actually touch, with a powerful sound engine derived from Moog's award winning synthesizer, Animoog. The Theremini guarantees immediate success to any player at any skill level, while providing new ways to experiment with music, education, and gestural control. Assistive pitch correction allows each player to adjust the instruments level of playing difficulty. At the maximum position, the Theremini will play every note in a selected scale perfectly, making it impossible to play a wrong note. As this control is decreased, more expressive control of pitch becomes possible. When set to minimum, the Theremini will perform as a traditional theremin with analog heterodyning oscillator and absolutely no pitch assistance. A built in tuner supplies real-time visual feedback of each note as it is played, as well as its proximity to perfection. This is useful for correcting a users playing position, or to educate younger players about pitch and scales. Recessed in the top of the Theremini is a compact speaker perfect for private rehearsal and quick setup anywhere. Silent rehearsal is also possible via front panel headphone jack. Simply plug in ear-buds or headphones and the built in speaker becomes silent. The Theremini is a re-imagination of one of the oldest electronic musical instrument in history, and Bob Moog's first love - the theremin. Its design fuses the experience of performing with an instrument you don't actually touch, with a powerful sound engine derived from Moog's award winning synthesizer, Animoog. The Theremini guarantees immediate success to any player at any skill level, while providing new ways to experiment with music, education, and gestural control.